Back in the 60s when the euphoria of African independence reigned, the 20-year-old Boubacar Traoré was Mali’s Chuck Berry and Elvis Presley. He was the first to play Mandingo-based music on electric guitar, long before his junior, Ali Farka Touré. Hits including “Mali Twist” and “Kayeba” (recorded by National Radio and widely played) provided dance music for a generation who were enjoying freedom for the first time. In 1968, when Moussa Traoré overthrew Malian president Modibo Keïta, Boubacar Traoré, widely seen as an artist associated with the previous regime, disappeared from the airwaves. 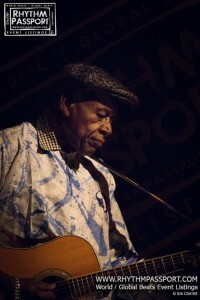 Returning penniless to Kayes, his hometown in the Kassonké region (to the northeast of Bamako near the Senegalese border), he became a farm worker, opened a shop with his elder brother - the one who had introduced him to the guitar and given him his first one - and worked to feed his family.